I don't know about you, but sometimes I'm cooking dinner, and yet all I can think about is how I don't have anything in the house for desert. This, by the way, is a disaster for me because I have to finish off every meal with something sweet! Whilst dashing about the kitchen looking for something, anything to throw together, all I could find were bags and bags of porridge oats that I usually use for homemade granola. 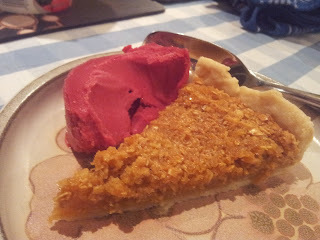 A brain wave hit me ... Treacle Tart! This is a great desert to use up little bits and pieces from the kitchen; you don't need many ingredients, it's quick and yet it really hits the spot after a weekday dinner. 8) The tart can now cook away whilst you enjoy your dinner :) When you're done, take the tart out, leave to cool for a few minutes and then serve. TIP: You can tweak this recipe as you like. It may not be the most prestigious treacle tart, but I don't really think this matters for this type of desert. Enjoy :) Oh, and if you can beat my 1994 tin of Lyle's Golden Syrup - do let me know!